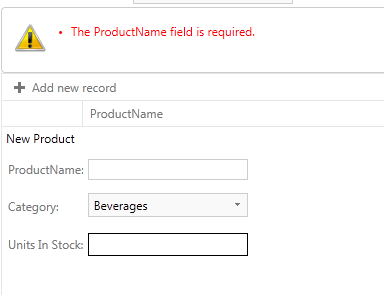 For example if SelectMethod returns data from Linq DataContext and if the paging of the bound control is turned on, the executed database query will return only items for the current page. If the bound control is sorted by a column the sorting also will be executed on the database and the sorted result will be returned. That is because the Linq will optimize the query to perform the sort and page operation as part of the database query. The returned query needs to be sorted by using OrderBy when LinqToEntities is used, otherwise the exception:The method 'Skip' is only supported for sorted input in LINQ to Entities. The method 'OrderBy' must be called before the method 'Skip'will be thrown. MultiColumnsorting is NOT supported when the ModelBinding is used. The code snippet above will get the name parameter from the QueryString and integer value of the selected item of the RadComboBox with ID equlas to “RadComboBoxCategories”.